NewAir AW-181E 18 Bottle Thermoelectric Wine Cooler (March 2019) Review! NewAir AW-181E is another NewAir wine cooler that we definitely recommend to everyone who is looking to store their wine in the best possible condition. It is perfect for those who’re looking to store as many as 18 standard sized bottles at a time. It is highly efficient and because it doesn’t use compressor it makes no noise at all. The thermoelectric does wonders as it preserves the essence of wine perfectly as it should. If you’re worried about your costly wine getting ruined due to bad storing then you should definitely get this. The interior has a nice LED lighting that looks cool from the outside. The doors are made of stainless steel and the overall design is also quite good. The shelves are easily removable if required so you can adjust the placing if you have larger wine bottles. It is designed to fit in usual Bordeaux bottles only. So you may need to adjust it a bit if you get some costlier wines which comes in different bottles. The lowest temperature it can go to is 54F and the highest is up to 66F. 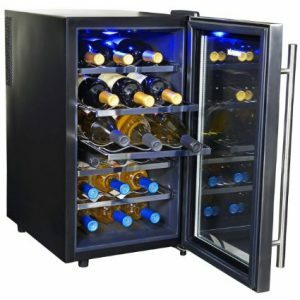 It is a single zone wine cooler so you cannot store both Red and White wines together since they require different temperature settings to stay in perfect condition. If single zone cooling works for you then you should definitely opt for this one. It costs under 200 bucks and the quality of the product is really good. There are many positive reviews on sites like Amazon. If you like you can head over here to read Amazon.com reviews with details. We’ve also reviewed NewAir AW-281E which is an upgraded version of this model. You can check it’s detailed review here. If you prefer a smaller wine cooler then you can read our review of Haier 6-Bottle Wine Cellar. Sunpentown WC-20TL is another wine cooler that we recommend that is similar to NewAir AW-181E, it can hold up to 20 bottles and costs just under $150 you can check our review on it here. If you’d like to head back to the list of 10 Best Wine Coolers Review then press here.